MIChild esta cambiando, y generalmente significara una mejor cobertura para los niños de Michigan. MICHILD ESTÁ CAMBIANDO, EFECTIVO EL 1 DE ENERO DEL 2016. Primero - ¿qué es MIChild? MIChild es el Programa Estatal de Seguro de Salud Infantil para niños que tienen ingresos mayores para Medicaid, pero cuyas familias siguen siendo de bajos ingresos. Si una familia tiene un hijo o más, el costo para la familia es $10/mes. MIChild seguirá costando $ 10 / mes por familia. Los pagos todavía se harán directamente a MIChild. MIChild todavía ofrece a sus hijos servicios médicos, dentales y de visión. Las aplicaciones para MIChild continuarán a través del sistema DHHS MIBridges. No habrá copagos para los servicios de MIChild. Visite michigan.gov/mibridges y solicite cobertura de salud. Los niños recibirán una tarjeta (Medicaid) mihealth en lugar de una tarjeta MIChild. La mayoría de los niños también recibirán una tarjeta de un plan de salud. Nota: Si alguna vez ha tenido una tarjeta de mihealth, y todavía no la tiene, tendrá que llamar y solicitar una. Llame al 1-888-367-6557. La cobertura dental tiene tres cambios: la cobertura ahora se llevará a cabo a través del programa Healthy Kids Dental (en muchos casos, esto significará más acceso a dentistas); No habrá límite máximo en dólares para los costos dentales; y la cobertura dental se limitará al beneficio dental de Medicaid. Ya no habrá acceso a la acupuntura. Su especialista en DHHS será responsable de ayudarle si necesita transporte para citas. (A menos que viva en los condados de Wayne, Oakland o Macomb, en cuyo caso llamaría al 1-866-569-1902). La oficina local del DHHS ahora procesará las inscripciones, y usted puede ser inscrito tan pronto como el mes después de su solicitud. Los cambios en los ingresos, el tamaño del hogar y las renovaciones serán procesados través de su oficina local del DHHS. La mayoría de las personas tendrán que elegir un plan de salud para sus hijos, y las opciones del plan de salud serán las mismas que las de los planes de salud de Medicaid. Si desea cambiar su plan de salud, llame al 1-888-367-6557. Encuentre aquí el folleto de Preguntas Frecuentes de MDHHS. Bajo las viejas reglas de MIChild, una solicitud recibida durante diciembre tendría una fecha de inicio de elegibilidad en febrero, las solicitudes de enero serían elegibles para marzo, etc. Las nuevas reglas promulgadas el 1 de enero del 2016 permiten que el niño sea inscrito en el mes de aplicación y permiten cobertura retroactiva por 3 meses o hasta la fecha en que el programa entró en vigencia, que en este caso es el 1 de enero del 2016. La cobertura retroactiva no puede aplicarse a diciembre del 2015 porque las reglas de MIChild no permitieron una cobertura retroactiva durante ese período. Teens Who Work: Does Their Income Count? Think of yourself as a teenager. Did you work? Did you have a summer job lifeguarding at a pool, or a year-round job bagging groceries? Did you referee kids' soccer or baseball, or babysit your neighbor's first grader? If you did work, then you are just like millions of American teenagers, who work for spending money, to help the family pay bills, or to save money for college. Lower-income families, filling out a Medicaid or Marketplace application, may wonder if the teen's income "counts." What if you have a dependent who is not a teenager, but who works? For example, what if your elderly mom lives with you and you take her as a dependent on your taxes? What if she works 5 hours/week at a local store? The same tax filing threshold rules apply. Maria is a single mom of Juan, age 17, and Elizabeth, age 10. Maria works for a temporary agency and makes about $1700/month, or $20,400 annually. Using just that income, she--and her children--all qualify for Medicaid. Juan wants to go to college, and worked all summer scooping ice cream. He made $5,000. During the school year, though, his mom doesn't want him to work, because she wants to make sure he gets good grades. If you answered #2, $20,400, you are correct. That's because Juan's ice cream income does not get added to the family income because it is less than the tax filing threshold. The entire family should be eligible for Medicaid. **Note that Juan might still file taxes since he might get some money back in a tax refund--but it's the fact that he doesn't HAVE to file taxes that will mean that his income doesn't get added to his mom's income for the purposes of health insurance eligibility. John and Anne are married. Sarah is 16 and Jesse is 14. John cooks at a restaurant and makes about $2500/month, or $30,000/year. Anne recently went back to college and works very part-time in a grocery store, making about $500/month, or $6,000/year. Sarah wants to go to college, and she also likes to have some spending money, so she works full time in the summer, and part time during the school year, at the restaurant where her dad cooks. This year, she expects made $10,000. If you answered #4, $46,000, you are correct. That's because Sarah's income is above the tax filing threshold (she must file taxes), and so it gets added to John and Anne's income. The children--Sarah and Jesse--will still be eligible for MIChild. If John does not have an offer of employer insurance, then John and Anne will be able to go on the Marketplace. Teen Jobs and Tax Issues from Bankrate. How to File Your Child's First Income Tax Return from Investopedia. IRS Publication 929 - a very detailed explanation of dependents and income filing requirements. Children’s Special Health Care Services is a state-wide program that serves children with chronic health problems and their families. The program can save families money and at the same time make sure that sick kids get what they need! The program's aim is to provide patients and caregivers with the knowledge and resources to receive the best quality care for their individual needs. 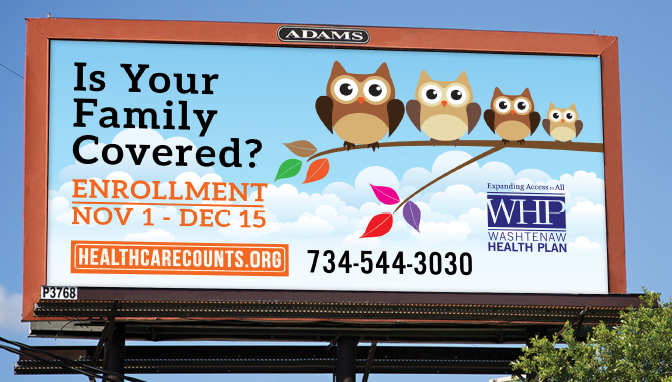 In Washtenaw County we currently have about 940 children enrolled! The program works as secondary insurance to help cover the cost of the child’s diagnosis. Which means the family’s primary insurance – such as employer insurance or Medicaid – pays first and then CSHCS picks-up the co-pays, deductible, and out-of-pocket costs related to the qualifying diagnosis. Max is enrolled is CSHCS because he has Type 1 Diabetes. One day, he loses consciousness during gym class. His school calls an ambulance. The paramedic finds that his blood sugar was too low. CSHCS will cover the cost of the ambulance ride, the ER visit, any medicine prescribed or tests run, and hospital admission if necessary. The out of pocket medical expense for Max's family is $0. But even during a good month where Max doesn't have to go to the hospital or to see a doctor, he still needs medication and supplies to help manage his Type 1 Diabetes. 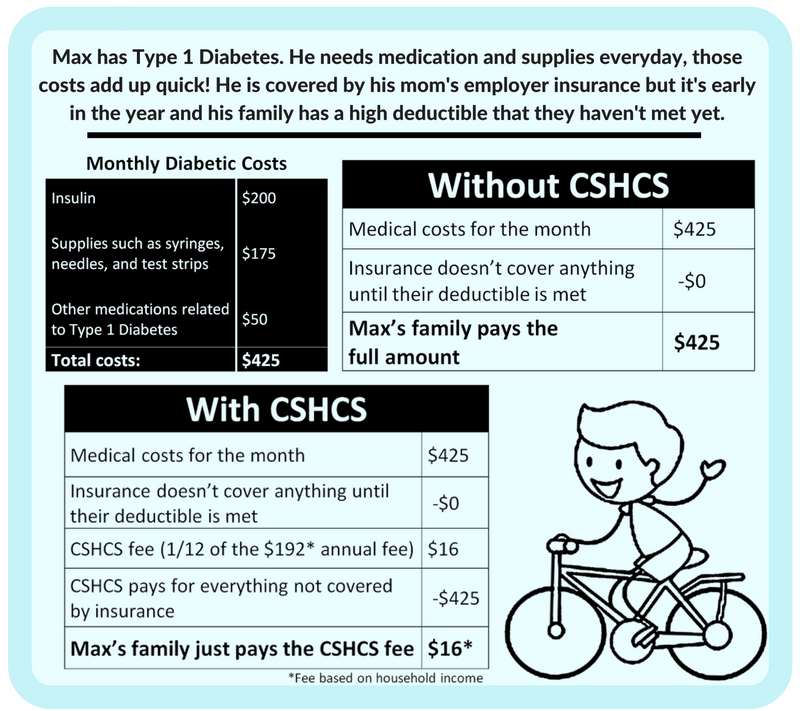 Look at the charts below to see how CSHCS helps Max's family cover those costs. It's important to note that CSHCS doesn't help cover all medical costs, only the costs related to the child's qualifying diagnosis. The program will not pay for visits to the primary care physician or any other unrelated medical costs. CSHCS covers children from birth to age 21 with one or more of the qualifying diagnoses. These diagnoses are any of 2,700 physical conditions like severe Asthma, Type 1 Diabetes, Cerebral Palsy, and different types of cancer. Click here for a list of these diagnoses. A lot of times, if a child is diagnosed with one of the diseases on the list, a nurse or social worker will recommend the child for the program and a designated pediatrician decides whether or not the child is approved. But sometimes, the program receives calls from parents who believe their child is a good fit for the program and then our public health nurses will investigate those cases further. The program may even help pay for the costs of diagnostic tests if needed. Is CSHCS Only For Low-Income Families? A lot of families don't know that they can enroll in CSHCS even if they have private or employer insurance! CSHCS is based on the child’s diagnosis, not income. So anyone with a child who has one or more of the qualifying diagnoses can enroll. There is a sliding annual fee which is based on the family’s income, but in certain cases--for foster children or kids already on Medicaid--the fee can be waived. For almost all current enrollees, the annually fee is significantly less than what the cost of healthcare would be without CSHCS. For more information you can visit the Children's Special Health Care Services website. Last names starting with A through J: Colleen Warner at 734-544-3080 or by email at warnerc@ewashtenaw.org. If you are a service provider or community partner, please contact our program supervisor, Christina Katka at 734-544-2984 or katkac@ewashtenaw.org. If you live outside of Washtenaw County you can find contacts here. Editor's Note: This blog post was written by Kayla Okarski, a Washtenaw County Public Health and Washtenaw Health Plan summer intern who is a senior at Grand Valley State University. Thanks Kayla for all of your work! MIChild is changing, effective January 1, 2016. First--what is MIChild? MIChild is the state-run Children's Health Insurance Program for children who are over-income for Medicaid but whose families are still low-income. Whether a family has one child or ten children, the cost to the family is $10/month. MIChild will still cost $10/month per family. Payments will still be made directly to MIChild. MIChild will still get your children medical, dental, and vision services. Applications to MIChild will continue to go through the DHHS MIBridges system. There will still be no copays for MIChild services. 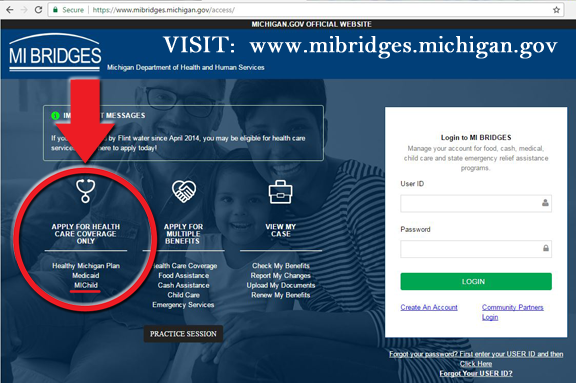 Visit michigan.gov/mibridges, and apply for health coverage. Children will receive a (Medicaid) mihealth card instead of a MIChild card. Most children will also get a card from a health plan. Note: If you ever had a mihealth card before, and you don't still have it, you will need to call and request one. Call 1-888-367-6557. Dental coverage has three changes: coverage will now take place through the Healthy Kids Dental program (in many cases, that will mean more access to dentists); there will be no maximum dollar limit for dental costs; and dental coverage will be limited to the Medicaid dental benefit. There will no longer be access to acupuncture. The local DHHS office will now process enrollments, and you can be enrolled as early as the month after your application. Changes in income, household size, and renewals will all be processed through your local DHHS office. Most people will need to choose a health plan for their children, and the health plan choices will be the same as the Medicaid health plans. If you want to change your health plan, call 1-888-367-6557. Find the MDHHS Frequently Asked Questions brochure here. Under the old MIChild rules, an application received during December would have an eligibility begin date of February, January applications would be eligible for March, etc. The new rules enacted January 1, 2016 enable the child to be enrolled in the month of application and allow retroactive coverage for 3 months or back to the date that the program became effective, which in this case is January 1, 2016. Retroactive coverage cannot be applied to December 2015 because MIChild rules did not allow retroactive coverage during that time frame.